Wall murals go back to the prehistoric times when they used to be plain drawings that you would find in caves. They were basically pictures of cattle, stags, horses and various other animals. At that time they were used by the authorities to get a political mes sage down to the lower classes. But today, wallpaper murals are used to decorate any room or space in your home giving it a distinct atmosphere. Wall murals are basically huge scenes, paintings or images that are shifted to a wall but murals basically can be used on a ceiling or any other flat surface. It should not be applied to surfaces that are rough. There are several techniques and styles that go into the construction of the murals. The most commonly known one is the fresco which was linked with the Renaissance paintings. Frescoes require painting on a plaster surface that is moist using water colors or a mixture of limewater. But today most of the handmade murals are produced by using media that is water or oil based. However, finding a professional artist to paint a unique piece of art can work out to be a very expensive option although it might sound good. But there are other options for wallpaper murals so read on. You will find that there are many companies dealing with wallpaper murals on the Net specializing in printing wall murals by making use of the technology that we have today. It is a lot cheaper as the image is not hand crafted. You also get tile murals which when arranged together in the form of small tiles gives you one big mural. This kind of tile murals are perfect for floor medallions, bathtub enclosures and kitchen backsplashes as they help in protecting your home against drips, spills, splatters and other forms of water damage. 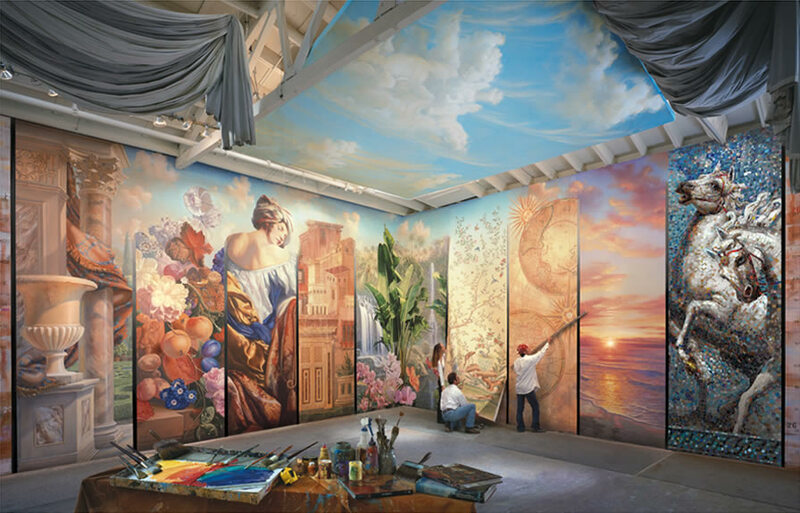 In order to put up the wallpaper murals you might need to get help if you are not comfortable doing it yourself. You can get in touch with the store where you bought the wall murals or you can call in the local handyman if you need the support. There are very few accessories and tools that you would need to put up your photo wallpaper or kids wall murals. You also have people who do this job professionally .Since the majority of murals are permanent in nature, you have to make sure that you select the design correctly and also make sure it is put up in the right place. There is no end to the number of designs you can choose for your wallpaper murals. You can also have photo wallpaper of beach scenes or the mountains or one with your kids; the choices are endless. You can use the wall murals in your kid’s room; choose from kids wallpaper murals which contain their favorite cartoon character, animal or sport.